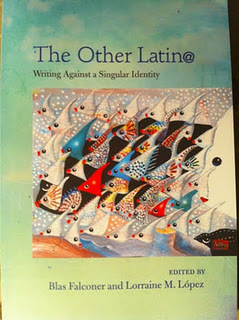 Edited by Blas Falconer and Lorraine M. López, The Other Latin@: Writing Against a Singular Identity (University of Arizona Press, 2011) is a diverse collection of essays written by some of the best emerging and established contemporary writers of Latin origin to help answer the question: How can we treat U.S. Latina and Latino literature as a definable whole while acknowledging the many shifting identities within their cultures? By telling their own stories, these authors illuminate the richness of their cultural backgrounds while adding a unique perspective to Latina and Latino literature.Essayists include Lisa D. Chávez, Teresa Dovalpage, Judith Ortiz Cofer, Joy Castro, Steven Cordova, Daniel Chacón, Urayoán Noel, Gina Franco, Peter Ramos, and others. The Other Latin@ is a finalist for Foreword’s Book of the Year Award, and has won an Independent Publisher Book Award: Silver in Adult Multicultural Non-Fiction (2012). 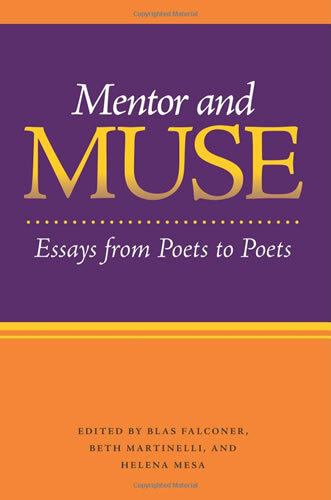 Edited by Blas Falconer, Beth Martinelli, and Helena Mesa, Mentor and Muse: Essays from Poets to Poets (Southern Illinois University Press, 2010) is a collection of twenty-nine insightful essays that draw upon both established and emerging poets to create a one-of-a-kind resource and unlock the secrets of writing and revising poetry. Each author examines in detail a particular poetic element, shedding new light on the endless possibilities of poetic forms, such as imagery, the duality of myth and the personal, and the versatility of traditional poetic forms. The essays include the full text of the poems discussed, and detailed, relevant writing exercises that allow students the opportunity to directly implement the strategies they have learned. While many advanced topics such as authenticity, discordant music, and prosody are covered, this highly readable volume is as user-friendly as it is informative. Essayists include Phillis Levin, Patricia Clark, Stanley Plumly, Claire Kageyama-Ramakrishnan, Michael Waters, Victoria Chang, Kevin Prufer, Shara McCallum, David Keplinger, Nancy Eimers, and others. For a sample essay, see Phillis Levin’s essay, “Recording Mortal Sight: The Drama of Prosody,” posted on Poetry Daily. Both The Other Latin@: Writing Against Singular Identity and Mentor and Muse: Essays from Poets to Poets are available at at your local, independent bookstore and at Amazon.